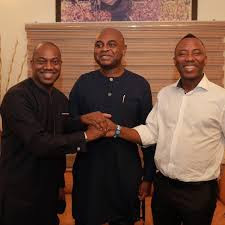 No fewer than 20 other political parties apart from All Progressive Congress (APC) and the Peoples Democratic Party (PDP) at the weekend elected their presidential candidates ahead of the February, 2019 general elections. Those elected to fly their respective parties’ flag include former governor of Cross River State, Mr. Donald Duke for Social Democratic Party (SDP); former Minister of Education, Mrs. Obi Ezekwesili, Allied Congress Party of Nigeria (ACPN); ex- Deputy Governor of Central Bank of Nigeria, CBN, Prof. Kingsley Moghalu, Young Progressive Party (YPP); former student activist and Publisher of Sahara Reporters, Mr. Omoyele Sowore, African Action Congress (AAC) and former deputy publicity secretary of the PDP, while Mr. Gbenga Olawepo-Hashim and Mr. Fela Durotoye are contesting the flag of the Alliance for New Nigeria (ANN). For National Interest Party (NIP) Ms. Eunice Atuejide is the candidate; YES PARTY has Alister Soyode; Dr Davidson Akhimien is for Grassroots Development Party of Nigeria (GDPN); All Blending Party (ABP) elected Mr. Moses Shipi; while African Renaissance Party (ARP)’s candidate is Alhaji Yahaya Ndu.